She wasn’t one for a month all about love or stringing hearts up about the house. She rolled her eyes at the idea of one day when someone you call sweetheart is supposed to buy you roses. She had spent so many days alone that even when she found herself in love and loved in return, she still tried to ignore this need others had to make one day about something that never quite felt real. She was quiet about it but mostly tolerated seeing everyone in red, and then she bought the chocolates when they went on sale. And in that post, I shared how part of this story changed forever on a day in the summer of 2010. Now I am a girl who loves hearts (as in I kind of can't get enough), who believes that "love is all you need," who believes we must invite in joy and peace and love each day, who believes in turning the idea of Valentine's Day on its head and making it more about love for self, for kindreds, for those who help you say "yes" to knowing you are not alone and that your story matters. Last February, the Heart.Full Collection was created as a way to say thank you to the hospitals that saved Ellie Jane's life in 2010 and to honor that love comes into our lives in so many ways. 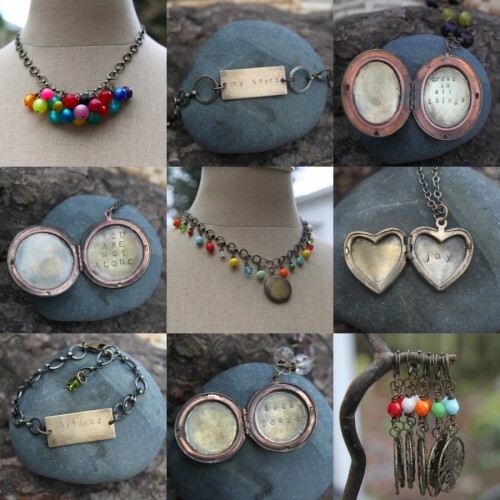 15% of the profits from this collection are split between Mary Bridge Children's Hospital and Seattle Children's. And I am happy to share that starting today through Valentine's Day, I will be giving 10% of all the profits from each item sold in the shop to the Heart.Full Collection contributions I will make this year with your help. Thank you for your support and kindness. Thank you for sharing your stories and catching mine. I am delighted to share that I am part of 52 Photos Project's Handmade Valentine's Day showcase this week! Each day Bella is highlighting a shop and mine is up today. I hope you will visit 52 Photos Project throughout the week to see what other good things Bells shares.